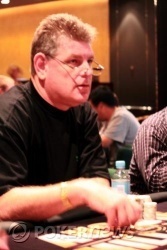 Congratulations to Mike "SirWatts" Watson; 2010 Crown Aussie Millions Event No. 7 Champion ($129,920 AUD)! Congratulations to Mike "SirWatts" Watson, who bested the field of 108 players to take down this $1,150 no-limit hold'em rebuy event, taking home $129,920 AUD. Watson has close to $2.5 million in career tournament winnings. He's no stranger to the live tournament circuit, as he already owns a WPT title. He took down the stacked final table with ease, going up against top pros like James Obst, Stewart Scott, Gary Benson, and even ex-cricketer Shane Warne. This tournament may be over, but the $100,000 Challenge is not. Be sure to follow the Live Reporting Team who are up in Studio 3 bringing you all the action from the felt. Mike Watson made it 12,000 to go preflop. Gary Benson raised to 26,000 and Watson pushed all in. Benson made the call putting his tournament life at stake. Watson's flopped set was good enough to end this event and send Benson to the rail. Preflop Mike Watson made it 12,000 and Benson made the call. Both players checked the flop. When the hit the turn Benson checked and Watson fired off another 12,000 bet to which Benson called. The river brought the . Again, Benson checked. This time Watson made it 25,000 and Benson folded. In this all-in preflop hand, Gary Benson tabled and Mike Watson showed . The board ran out , giving Benson the double up. Our two heads-up players limped preflop. The flop came down . Watson bet 8,000 and was called by Benson. The turn brought the , to which Watson fired an 18,000 chip bet and was called once again by Benson. Watson fired a 36,000 chip bet on the river and Benson folded. Benson is sitting on 70,000 chips currently. 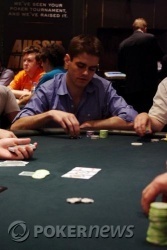 Florian Langmann made it 14,000 to go preflop. 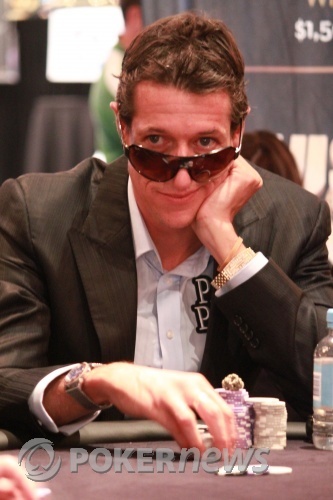 Mike Watson raised the stakes a little by putting his stack in the middle. Langmann made the call, putting his tournament life at risk. The board ran out to give Watson a pair of fours and send Langmann to the rail for his $64,960 consolation prize. The rail is still full of spectators here and more folks keep coming up to check out the action. The railbirds have event spilled over onto the tournament floor and checking things out from inside the rail. Preflop from under the gun, Florian Langmann made a bet of 8,500. James Obst answered that with an all-in shove. Not to be outdone, Mike Watson put his massive stack in the middle too. Langmann quickly got out of the way. When the cards were on their backs Obst showed and Watson tabled . The board ran out and Obst walked quietly to the rail. From the button, James Obst made it 8,000 to go and was called by Mike Watson in the big blind. The was checked by both players. When the fell on the turn, Watson fired out a bet of 12,600 and was called by Obst. A 27,500 chip bet was made by Watson on the river and was called by Obst as well. Watson showed for a pair of tens and it was good enough to get Obst to muck.